JERUSALEM—In the historic Nachalat Shiv’a neighborhood in the center of Jerusalem, in a quiet alleyway just steps away from Zion Square, men gather soon after Yom Kippur in the first synagogue to be built outside of the Old City walls after the destruction of the Temple. They are here to work, but it is joyous work of a different kind. 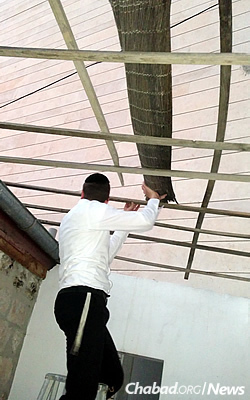 Like many Jews around the world, those meeting at night at the Nachalat Yaakov Synagogue are building a sukkah in anticipation of the festival that begins at sundown on the 15th of the Hebrew month of Tishrei, which corresponds this year to the night of Sunday, Sept. 27. 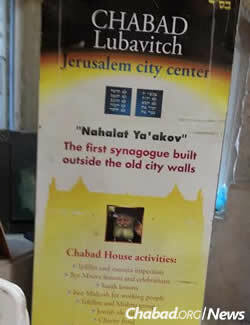 The Nachalat Yaakov Synagogue, now more than 140 years old, still serves not only its original purpose—as a focal point and house of worship for 19th-century pioneers who moved from the Old City—but as the current mainstay and headquarters of the Beit Chabad (Chabad House) of the Center of the City of Jerusalem. 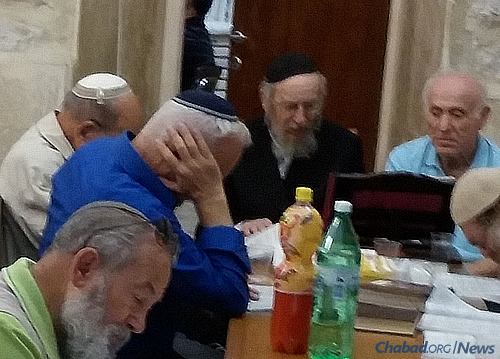 The storied synagogue has been under the rabbinic leadership of Rabbi Zev Dov Slonim for more than 40 years now. 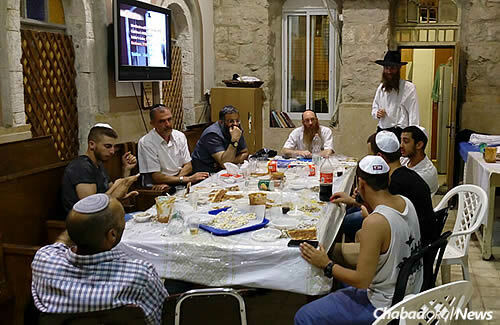 He was joined by his son and daughter-in-law, Rabbi Yosef Yitzchok and Zahava Slonim, co-directors of Beit Chabad of the Center of the City of Jerusalem, to serve the ever-expanding needs of neighborhood residents, in addition to the throngs of daily and nightly visitors to the area. Though Nachalat Shiv’a has undergone drastic changes over the last century-and-a-half—having become a hugely popular pedestrian way filled with arts, crafts, shops, restaurants and bars—the Beit Chabad at the Nachalat Yaakov Synagogue has found its niche in being able to reach hundreds of Jewish people every week with its numerous activities. The work continues on Saturday nights with a melaveh malkah (the traditional meal after the Havdalah ritual), where there is more food, song, learning and discussion. The Beit Chabad also has a Beit Midrash, a study house, which not only provides a minyan for prayer but a place for tourists, visiting and local businesspeople, and students in the center of town to stop in and learn Torah, Talmud, Tanya, Chassidus and halachah (Jewish law), either alone or together in classes given daily. The synagogue had its start in 1866, when a cholera epidemic swept through Jerusalem’s walled city, wiping out much of the populace due to overcrowding and poor sanitation. Seven families, including the great-great-grandfather of Israel’s current president, Reuven Rivlin, purchased land and founded the third Jewish neighborhood outside of the walls. In 1869, the first homes were ready to be occupied in the newly created neighborhood called Nachalat Shiv’a (or the “Inheritance of the Seven,” after the seven families). 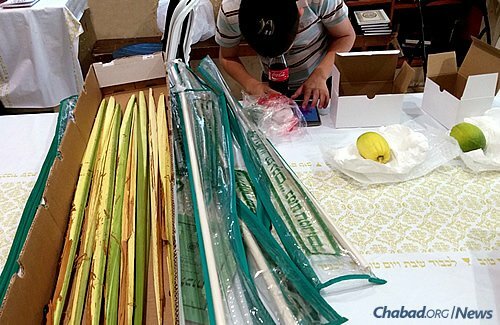 Slonim and his crew of yeshivah students, both single and married, have also plunged straight into the preparation of the Sukkot festival. 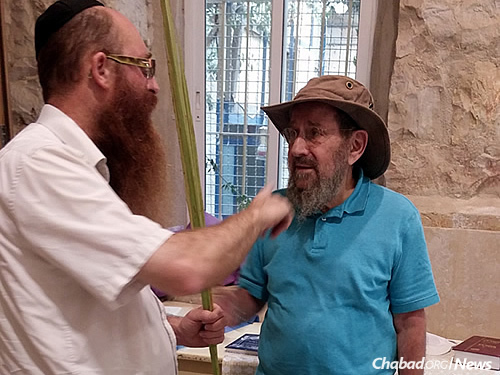 Besides the sukkah built on the synagogue’s property, the rabbi also organizes the sale of the arba’at haminim, “The Four Species” or “The Four Kinds”: a palm branch (lulav), two willows (aravot), a minimum of three myrtles (hadassim) and one citron (etrog). In addition to the sukkah at the synagogue, another one will be erected on Sunday, Erev Sukkot, right next to Zion Square. The rabbi also has a message about the very special status of this holiday season: “This year, 5776, has even additional joy and meaning, as it is the Hakhel year. After a Shemittah year, during Sukkot, there was a special ritual at the Beit Hamikdash where the king would read from his Torah, and every Jewish man, woman and child attended, that they should both hear and see, just as the entire nation received the Torah from G‑d at Mount Sinai. Young people come to the Nachalat Shiv’a area for its restaurants, bars and shops, but many find the synagogue—and wind up spending time learning with others at all times of the day and night. For information, inspiration and Hakhel year gatherings near you, visit Chabad.org’s special Sukkot section here.